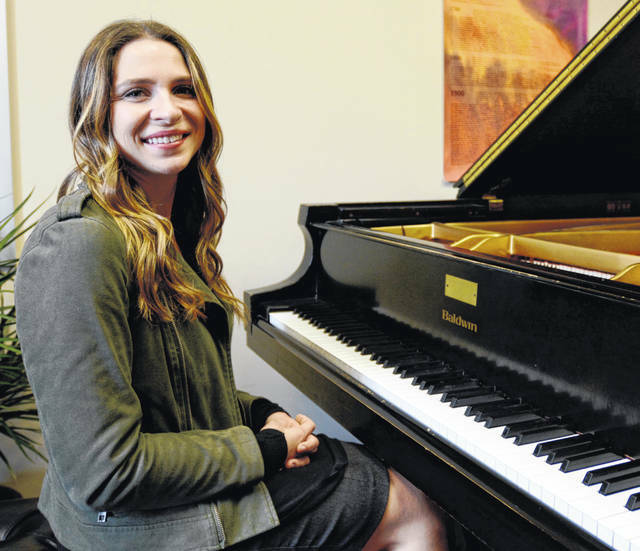 Brianna Matzke’s work as a pianist has been hailed by Cleveland Classical as possessing “a sense of refinement, flair and technical prowess.” She will premiere unique interpretations of songs from Bob Dylan’s Highway 61 Revisited. Against the pop music backdrop of full-force Beatlemania, Bob Dylan released a landmark album in mid-1965 that addressed a society in flux with all its manifestations: war, civil rights, gender roles, existential questions and the emerging counterculture. Highway 61 Revisited was a landmark musical and literary statement. Reactions to that classic piece of music will be presented in a Response Project production in mid-November titled Something Is Happening Here. It features the premiere of nine short films and a dozen pieces for piano. Dr. Brianna Matzke, assistant professor of music at Wilmington College, will present a pair of piano concerts Nov. 15 and 16, at the Woodward Theatre, at 7 p.m., in Cincinnati’s Over-the-Rhine. Each will feature a host of composers’ unique interpretations of Dylan’s music from that seminal album. The shows will open with the screening of several short films depicting cinematic interpretations from Highway 61 Revisited. The mutually distinct Thursday and Friday concerts will feature the album’s sides one and two, respectively, with each program offering a three-number encore of other unique interpretations of Dylan’s music. Conceived by artistic director Matzke, Response Project is a commissioned initiative that asks composers and other producers of creative media to respond to a pre-existing work or idea. Something Is Happening Here, which is a line from Highway 61’s “Ballad of a Thin Man,” is the third Response Project since 2015. Matzke said the confluence of fear, uncertainty and social division existing in America today makes it a perfect time to reflect upon Highway 61 Revisited, which was informed by, well, the fear, uncertainty and social division existing in the United States in the mid-1960s. Highway 61 Revisited represents a critical juncture in Dylan’s storied career as a singer, songwriter, musician, poet and philosopher. It marked his controversial departure from acoustic folk music with his first recording of songs using rock musicians. A month before the album’s release in August 1965, at the Newport Folk Festival, Dylan stunned his following of folk music faithful by introducing electric guitars to his repertoire. Matzke said the piano compositions she will perform are unique interpretations of Dylan’s music — not new arrangements. Audiences will not hear the familiar melodies of “Like a Rolling Stone,” “Queen Jane Approximately” or the title track, but rather abstract interpretations. “Each artist — the musical composers and filmmakers — was free to respond to Highway 61 Revisited how they wish,” she added. It’s especially interesting that Dylan, who crossed genres from folk to rock, will now have his songs applied to classical music. Matzke asks those who associate classical music with terms like “old, stuffy, highbrow or even boring” to come with an open mind. “For me, it’s a living art form that’s fresh and interesting — and relevant,” she added. Matzke noted the Response Project wishes to create a “generous and safe space for interpretation” by each person who comes into contact with Dylan’s music. “If ever there was a time to revisit and re-examine Highway 61 Revisited, the time is right now. Tickets for Something Is Happening Here are available on a sliding scale in one or two-night packages and, along with additional information about the shows and associated events, can be ordered at www.woodwardtheatre.com/shows/response-project. Other events associated with Something Is Happening Here include: A panel discussion hosted at Cincinnati Contemporary Arts Center, Nov. 7, at 7:30 p.m.; an evening of multimedia art presentations and performances at Chase Public, Nov. 9, at 8 p.m.; and short film response screenings Nov. 18 and 20, at 7 p.m., at The Mini Microcinema.